Former Colorado Gov. John Hickenlooper, by contrast, has resisted efforts to label him a capitalist . Yet he lands at the more capitalistic end of the Yahoo Finance analysis, along with Washington Gov. Jay Inslee and former Maryland Rep. John Delaney. There are several useful takeaways for voters. It’s no accident that the two declared candidates with gubernatorial experience—Hickenlooper and Inslee—are at the capitalistic end of the field, since governors have to work with businesses to develop pragmatic tax and regulatory policies that generate jobs. 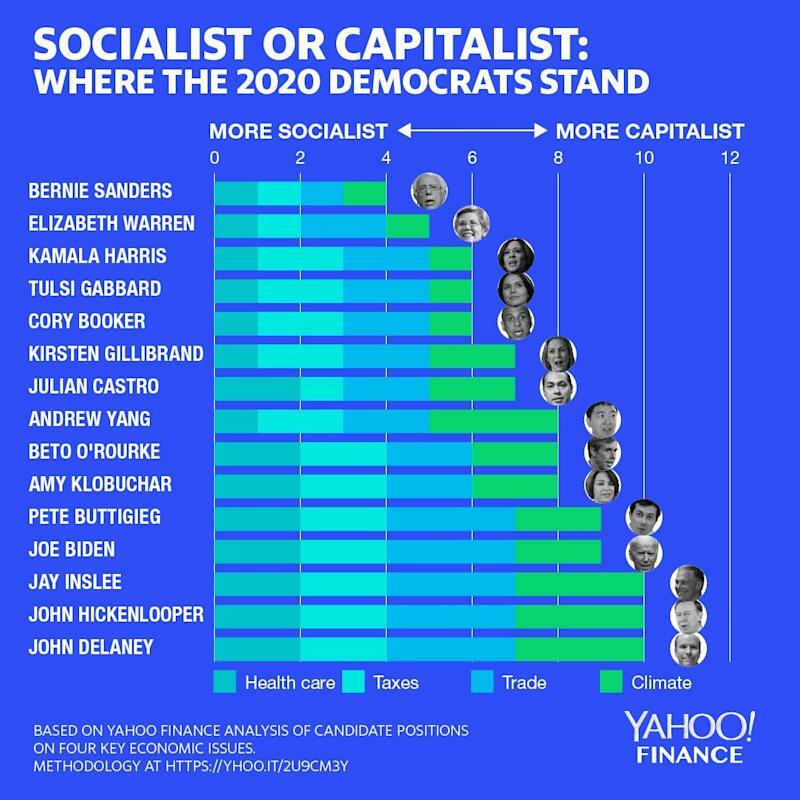 Joining them at the capitalist frontier is Delaney, who made millions starting and running two successful businesses , and only ran for office after that. On taxes, we considered plans to redistribute wealth through taxation—such as Elizabeth Warren’s wealth tax —as more socialistic. Politicians don’t often tout tax hike plans, but they do sometimes favor sweeping new programs—such as Sanders’ free-college plan —that necessitate higher taxes. We also rated those more socialistic. Tax hikes aren’t inherently bad, but economists generally say growth is strongest with the lowest possible level of taxation needed to meet public needs. And there are other ways to raise up those left behind, such as Delaney’s plan to incentivize investment in underperforming parts of the country. On climate policy, we consider the Green New Deal to be the most socialistic plan out there for addressing global warming. At least five of the candidates—Booker, Harris, Sanders, Warren and Gabbard—support the GND, which would put the government in charge of the much of the energy and transportation sectors and require large tax increases . In this instance, there are clear market-based alternatives that are more capitalistic, such as imposing carbon taxes and letting the market sort out the most efficient way to cut pollution. Inslee, who’s campaigning primarily on a “ climate mission ,” would push reforms down to the state and local level, end existing carbon subsidies (capitalistic!) and involve businesses in his crusade to reduce emissions.